One Powerful Event. A World of Solutions. Formerly the ASIS Annual Seminar and Exhibits, Global Security Exchange (GSX) delivers new opportunities to exchange key ideas and best practices, expand global connections, and experience innovations. And with the new name comes a sharpened focus on security from a global perspective—through shared ideas and experiences, content related to current and emerging threats worldwide, and wide-ranging technologies that address unique needs in every market. But it’s more than just a new name. GSX has elevated the event experience with interactive education, revitalized networking, and a reimagined exhibit hall. Join your peers in Las Vegas and multiply your strategies to proactively anticipate and stay ahead of the rapidly changing threat landscape. Why Should You Attend GSX? Designed for interactive and collaborative learning, GSX education sessions provide valuable, actionable takeaways to help shape your security strategy—today and in the future. Showcasing the full spectrum of security—from virtual reality to robotics and access control to alarms—you can explore, compare, and invest in the best solutions for your specific needs. In a packed exhibit hall comprised of 550+ exhibitors, education theaters, live demos, and the Innovative Product Awards, you’ll experience new and emerging technologies before they hit the market. Make the most of your time in Las Vegas by adding a pre-conference program to your agenda. These one- and two-day intensive courses provide an unparalleled opportunity to gain professional and career-building knowledge in a setting designed for collaboration and learning. It’s no secret that security professionals around the world work night and day to protect their organizations, communities, and assets. And at GSX, we like to celebrate our achievements and honor our peers at the industry’s most legendary networking events. 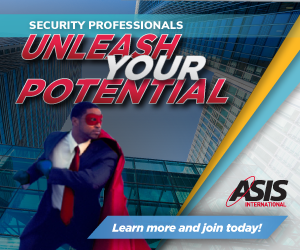 ASIS International has a global community of 35,000 security professionals representing all aspects of security from business continuity and risk management to insider threats and active shooter incidents to IT security and cybercrime.